Hey there, a little while ago I was in San Diego, CA for a family vacation. Through some mysterious internet savvy, my brother-in-law and sister managed to book us a room at the classic Westgate Hotel in the Gaslamp Quarter. Serious internet hotel booking voodoo magic. We’d heard that brunch at the Hotel was AMAZING, so we set out to give it a try – unfortunately (and also fortunately) we were hungry around breakfast-time (that whole East Coast – West Coast time change really got us) instead of brunch-time so we decided to have regular breakfast instead of the fancier brunch. In any case, both meals are served in this amazing room. 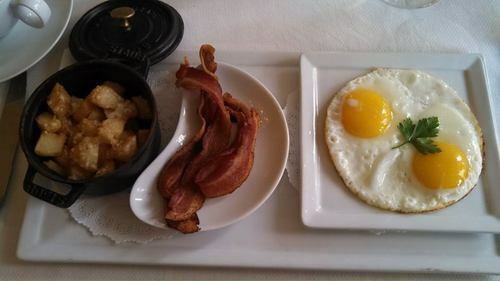 Since we were there, we decided to do it up and get a variety of breakfast items…you know…for research. My sister had the Pancakes with two eggs which I, of course, sampled liberally. The pancakes were a little plain on their own and a bit on the dense side but serviceable. The eggs were ordinary and the potatoes were excellent, there was some sort of cheesy topping that really sealed in the goodness. 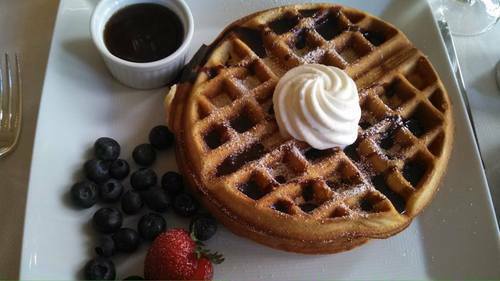 I mixed it up and had the waffle. The cream was really good – it tasted fresh and lightly sweet. Overall, the waffle had some good flavor but could definitely have been fluffier. As they were, the waffles sort of sat in my belly, definitely not optimal. (oh, btw, my brother in law makes the BEST waffles…if you’re interested in diversifying out to waffles, let me know, I might be able to convince him to do a guest post.) 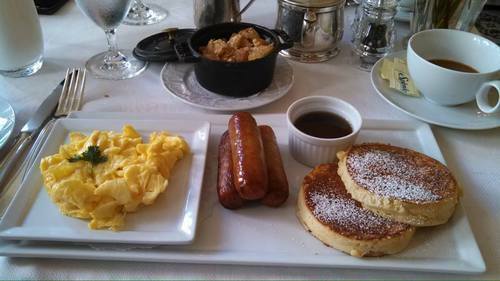 What was really good was the syrup, I think it had melted butter mixed into it – genius. The waffles definitely needed the toppings: syrup, cream, fruit, on their own, they were….not something I’d choose to eat. My brother in law went with the classic American breakfast. What can I say, it’s a classic for a reason. His breakfast also came with some danish – the danish was more like a sweet roll than your classic danish but it was warm and delicious. Oh, and my niece had some donuts! 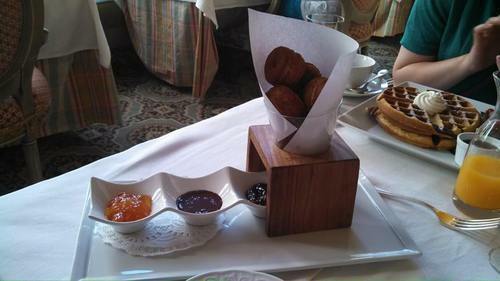 The donuts were also a little dense, but there was a warm chocolate dipping sauce that was the bizomb. BAM. Warm chocolate makes everything good. Overall, the food was good/okay, but the ambiance more than made up for it. Palatschinken are sort of like Austria’s answer to the French crepe, and they are delicious. 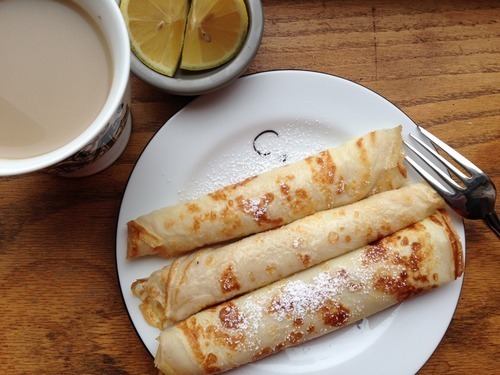 There’s actually a whole bunch of crepe-like pancakes from eastern/central Europe. Besides palatschinken, there are palačinka (found in Bosnia, Bulgaria, Croatia, the Czech Republich, Serbia, Slovenia, and Macedonia), Slovakian palacinka, and hungarian palacsinta, to name just a few. If you’re looking for a quick crepe recipe in a pinch, definitely check this recipe out – the recipe is super simple and easy to whip up. 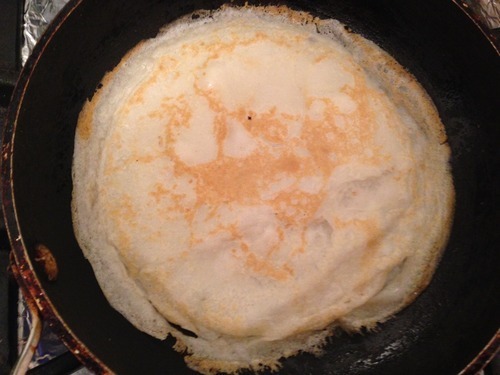 Part of the reason why palatschinken are easier to work with are: (1) the batter doesn’t need to rest so you can use it right away, and (2) the batter is a bit thicker than that for crepes so the pancakes are slightly heartier and less prone to tearing. And, like crepes, the flavor of the palatschinken is pretty mild lending themselves to a variety of toppings. I went with a drizzle honey, a squeeze of lime, and just a light sprinkling of powdered sugar. These would be just as delicious with fresh fruit, jams/jellies, nutella, peanut butter….you get the idea. I love sweet potatoes, and, actually, I like sweet potato pie even better than pumpkin pie, so when I found this recipe for Sweet Potato Pancakes with a Brown Butter Syrup, I was excited to say the least. 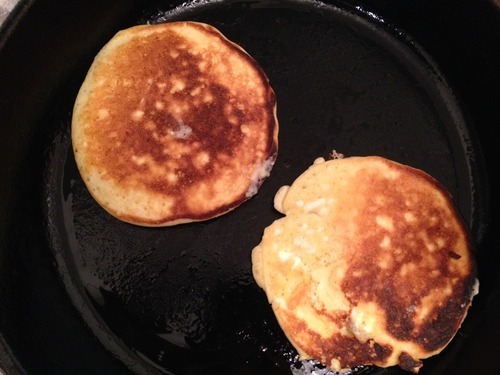 If you’re anything like me, I’ll save you the pain of having to wait a second longer and give you the original recipe and my version here (which makes half batch of about 9 palm-sized pancakes). The first time I ever had sweet potato, it was when my older sister took me to the Union Square farmer’s market in the fall and let me pick out a few goodies (that was also where I had strawberry-rhubarb crumble for the first time, another favorite of mine!). 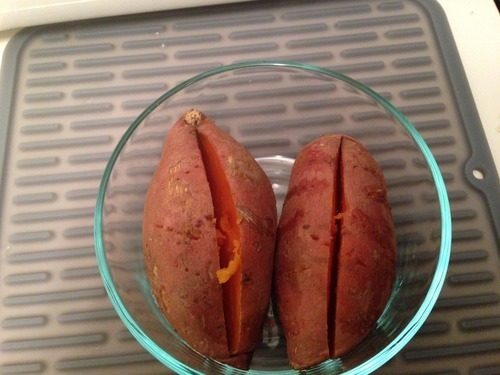 It was love a first bite, I love the delicate sweet flavor of sweet potato, in my opinion, it’s the more demure cousin of pumpkin and I’m all about it. These pancakes have the same sweet delicacy of the sweet potato and will definitely satisfy anyone with a sweet potato tooth. 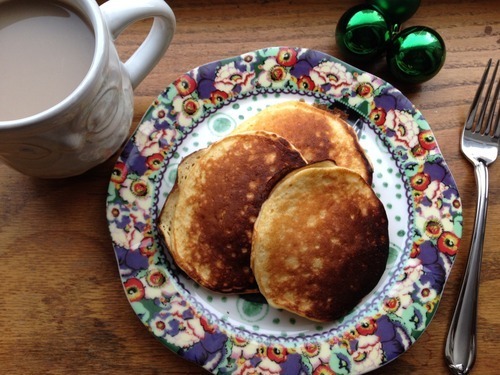 On their own, the pancakes are lightly sweet and with just a hint of that potato-y goodness. With the sauce, the pancakes are outrageous. They also have an awesome toothfulness, a little chewy but still light and fluffy. 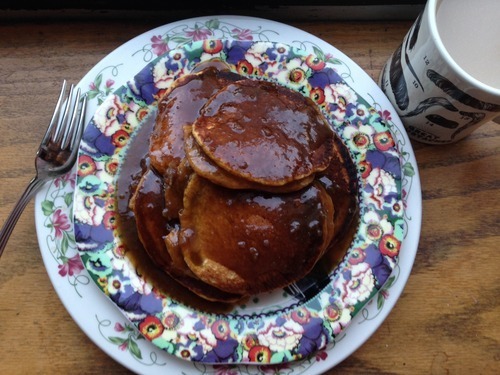 With the sauce, these pancakes will definitely transport you to fall, if not to the front of the fireplace, they totally give off that warm comfort food, “I just want to lay in a mountain of blankets vibe”…so perfect weekend food. 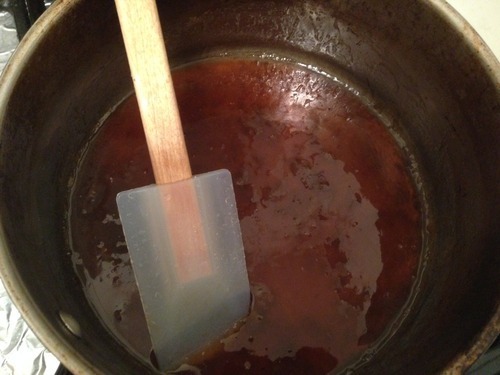 Oh, and if the sauce hardens on you (like it did to me), just reheat it a little – not too much because you don’t want the sugar to burn, but if you turn the stove on low and stir, the sauce should get re-sauce-ified in just a few minutes. So, these “Cloud Pancakes” get most of their texture from small curd cottage cheese, it might sound weird, but it actually kind of works. This is the second time I’ve used cottage cheese in pancake batter, (the first time was with these carrot cottage cheese pancakes) and both times, the pancakes came out fairly interesting. To jump to the recipe, click here, and for the original recipe, go here. Like the carrot pancakes, these were also very very soft. Almost a little too soft, I like my pancakes with just a bit of toothsomeness. 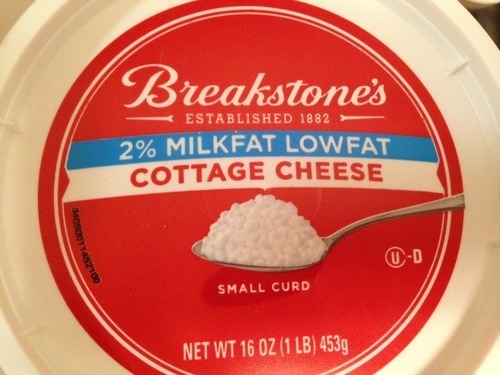 The other thing was that the overall flavor was kind of plain with a hint of cheesiness. It was really neither savory nor sweet and I would’ve preferred a more definitive flavor profile one way or another. I ended up eating these topped with nutella, which made them delicious, although, nutella generally has that effect on most things. If I were to make these again, I’d definitely add some zest to the batter, orange or lemon depending on how I was feeling, or maybe even some apple chunks. 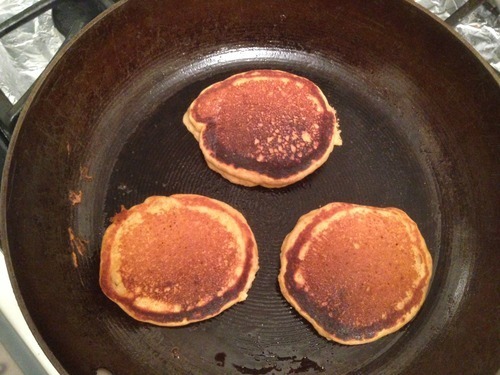 Either way, these pancakes definitely need a kick in the pants to earn some more stackies.